Smart Lighting - Industry Market Research, Market Share, Market Size, Sales, Demand Forecast, Market Leaders, Company Profiles, Industry Trends and Companies including Honeywell, General Electric, and Eaton. While consumers can appreciate the energy-saving potential of smart lighting, their electrical expenses generally are not so high as to make reducing lighting consumption a top priority. Rather, smart lighting appeals to consumers primarily as a convenient, new way to interact with their home lighting. Suppliers can capitalize on consumer views of smart lighting as a convenience and a novelty by emphasizing its advanced control capabilities, including automated features, wireless control (including away-from-home), and voice control. Suppliers should also emphasize their products’ seamless compatibility with smart home speakers, hubs, and apps for smartphones, as well as color temperature and light color options that can be customized to suit different activities (e.g., watching a movie, settling down for sleep, getting out of bed). Will the United States market see growth in this industry? Yes! The IoT market is booming and fueling robust growth for smart lighting and myriad other applications for smartdevices (e.g., smart home security and HVAC, quality control for manufacturing, municipal waste management). Reasons for the growth include smart lighting energy savings, analytical capabilities, lighting automation, and wireless and voice controls. Concerns that suppliers will need to address include security and privacy issues, interoperability of different devices, general user friendliness, and reliable connectivity. How is the market for light sources? Sales of light sources are expected to increase 7.5% by year-end 2018. The light source market has seen a rapid shift in product mix in the last decade as LED lighting – an energy-efficient and long-lasting alternative to traditional light sources such as incandescent and fluorescent types – has become dominant. While the market share gains of LED lighting continue to have a significant impact on light source pricing and demand in volume terms, the overall effect so far has been to boost demand in value terms due to LED lighting’s high value compared to traditional light sources. The US lighting industry’s rapid shift to LED light sources was spurred by the Energy Independence and Security Act of 2007 (EISA), which required suppliers to improve the energy efficiency of their products. New efficiency standards first went into effect in 2012 and essentially mandated the phase-out of many traditional light sources – including most incandescent and halogen light bulbs. The law also encouraged the rapid development and adoption of LED lighting – even at the expense of other fairly efficient types, such as compact fluorescent lamps (CFLs) and high intensity discharge (HID) light sources. Light sources that do not themselves contain smart tech but are used in otherwise smart lighting systems are not included in the scope of this study. LEDs that are integrated into smart fixtures are considered part of the fixture and do not contribute to smart light source demand. 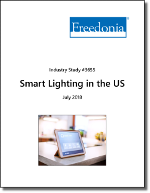 Information and data on smart lighting products were obtained from numerous primary and secondary sources, including industry participants, government agencies, trade associations, online databases, company annual reports and investor presentations, and other Freedonia Group studies. Primary information was gathered through consultations with marketing/technical personnel of participating companies and other industry specialists. Need more detail on methodology? Ask your Freedonia representative or email info@freedoniagroup.com! The key feature that differentiates smart lighting from traditional lighting is two-way digital communication among lighting devices or between a lighting device and external controls, as opposed to the one-way, passive transmissions common in traditional lighting (e.g., remote controls, timers, and daylight and motion sensors). Unlike a traditional lighting device – which historically could be set up to passively receive digital signals associated with certain functions (e.g., on/off or brightness settings) – smart lighting devices can relay information (e.g., usage or energy consumption data) back to a controller (e.g., an app on a smartphone) or centralized control system. Are you looking to answer any of the following questions? How is demand impacted by innovations like smart cities? Which markets (residential and commercial) offer the best opportunities for smart lighting growth? What is the value demand for smart lighting? How are companies competing within the industry?